I am arranging and knitting Italian threads. It is a perfect handbag for spring and summer. 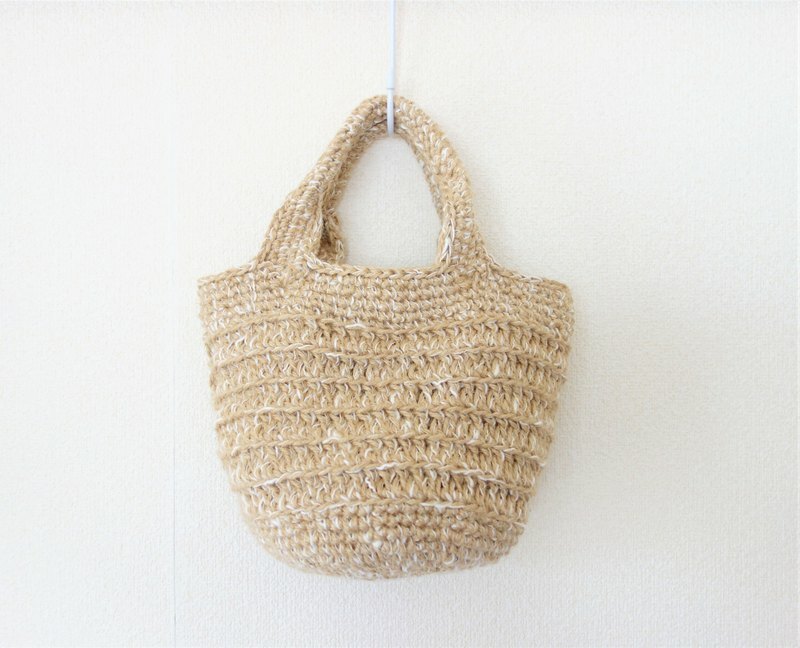 It is a handbag knitted with hemp, original Italian thread with unevenness. You can choose from four colors, white, brown, yellow and blue, to match the hemp and base. The crisp pattern is improving the natural feeling. Please use as a back for everyday use. https://i.pinimg.com/originals/9f/c6/84/9fc6844fa3b788f675185563b54f27d5.jpg All necessary items for a little outing such as wallet, water bottle, pouch, paperback book, smartphone etc. are included. The inner cloth is not attached. If you want to attach please purchase from here. https://pinkoi.com/product/k6mzH4F4?category=1 Please choose from the following four types of threads to match the hemp and base. https://i.pinimg.com/originals/3f/51/b2/3f51b27fac0948dfea62eed3d16b310b.jpg https://i.pinimg.com/originals/b6/13/7e/b6137ee7712bab530fbf6b99c9ad82d1.jpg // size // Bottom diameter about 18 cm Height body only about 22 cm ※ Because it is handmade one by one, some errors may occur in size. // materials // Hemp (Jute 100%) Italian silk (32% cotton, 29% acrylic, 24% hemp, 10% rayon, 5% nylon) // how to care // Please wipe with a cloth squeezed hard when it gets dirty. Although you can wash it with water, please wash gently and please shade it after adjusting the shape. // notes // · You may be concerned that the fibers of hemp can be attached to clothes. If you use it, it will not bother you, but please be careful when matching with darker clothes. · Folding and shipping. Please hang it for a while after arrival, please use after shaping the shape. Please do not hesitate to contact us with a message if there is something to worry about.